A 2011 survey of over 1,000 farmers from across the United States, conducted by the National Young Farmers Coalition. The survey found access to capital, access to land, and health insurance to be the largest obstacles for beginning farmers. 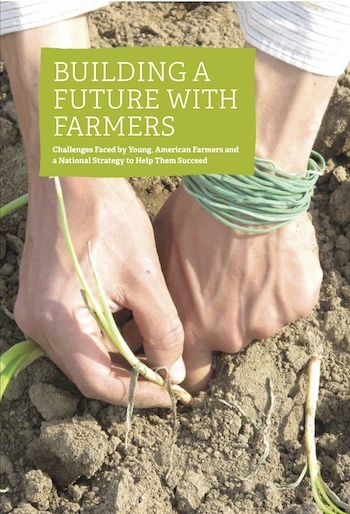 TIVOLI, NY (Nov. 9, 2011)—The National Young Farmers Coalition released a study today showing that the nation’s young and beginning farmers face tremendous barriers in starting a farming career. Building a Future With Farmers: Challenges Faced by Young, American Farmers and a National Strategy to Help Them Succeed surveyed 1,000 farmers from across the United States and found that access to capital, access to land and health insurance present the largest obstacles for beginners. Farmers rated farm apprenticeships, local partnerships and Community Supported Agriculture (CSA) as the most valuable programs to help beginners. Lack of capital was found to be the biggest challenge for beginners. Although the USDA’s Farm Service Agency offers loans to beginning farmers, current loan rules often disqualify even experienced farmers with good credit and small loans are hard to come by. For real estate transactions, FSA loans take too long to process—up to thirty days to qualify and up to a year to receive funds—and the $300,000 loan limit doesn’t go far in many real estate markets. “In Nebraska the main barrier to new and beginning farmers is access to land. Unless an aspiring farmer inherits land, it is very difficult to have access to it,” said William A. Powers, farmer and Executive Director of the Nebraska Sustainable Agriculture Society. The National Young Farmers Coalition recommends action at the local, state and federal level to help beginning farmers. At the local level, communities can create market opportunities for farmers by starting Community Supported Agriculture groups and shopping at farmers markets, as well as protecting existing farmland through zoning and the purchase of development rights. States can preserve farmland and even offer tax credits for farmers that sell their land to beginners. At the federal level, Congress can include the “Beginning Farmers and Ranchers Opportunity Act” in the next Farm Bill, which supports many of the specific recommendations in the report. Secretary of Agriculture, Tom Vilsack, is calling for hundreds of thousands of new farmers nationwide. Over the past century, the total number of American farmers has declined—from over 6 million in 1910 to just over 2 million today. For each farmer under 35 there are now six over 65 and the average age of farmers is 57. The USDA expects that one-quarter (500,000) of all farmers will retire in the next twenty years. The “good food” movement is inspiring many young people to farm, both from farming and non-farming backgrounds. These farmers have the potential to offset the numbers of retiring farmers and keep family farms active, but land tenure and lack of capital are getting in the way.